This article is reprinted with permission from Jim West. This article argues for mandatory air pollution review during flu diagnoses. It also argues that public perception of air pollution is minimized for reasons of industrial economics and politics, by way of laws, rules, education, mainstream news, and paradigm promotions embedded in entertainment. Flu is nearly always considered viral, as evidenced by a search of the CDC (Centers for Disease Control) website, the New York Times, or any media. Medical campaigns vaccinate millions worldwide, purporting to protect against flu epidemics, yet the symptoms of viral flu are the same as those of toxicological flu, and flu epidemiology makes toxicological sense. Given that air pollution disease is "often mistaken for a viral syndrome," how often does this mistake occur? In late April 2009, as the swine flu epidemic emerged in New York City, Charles D. Connor, president and CEO of the American Lung Association, was quoted in a press release: "Six out of 10 Americans live in areas dirty enough to send people to the emergency room, to shape how kids' lungs develop, and even dirty enough to kill." Historical Precedent. Governments appear to have sponsored the interpretation of severe flu epidemics with industrial bias. Tim Williamson (National Society for Clean Air) then draws the parallel to the contemporary petrochemical industry and its mobile exhaust outlets, motor vehicles: "Now there are 28m vehicles, 85% of them cars. ... We have defeated one problem only to create another, and [this government] has yet to come to terms with the problem." Causation for seasonal, summer mortality is often advertised as "heat waves" in cities like Pittsburg, Chicago, and New York. Meanwhile temperatures can be 30� higher in Phoenix without any "heat wave" mortality. In 2003, a great heat wave epidemic struck Europe, mostly in France. Causation was advertised widely as a heat wave. Much later, brief press releases mentioned that some scientists believed that this epidemic was due to air pollution. For example, on Sept. 1, 2003: "PARIS (Reuters) � Air pollution may have been the cause of death for thousands of French people who died in a heat wave that struck Europe this August, an environmental official said. ..."
Severe Acute Respiratory Syndrome (SARS) has obvious toxicological factors, with its biggest epicenters being downwind from major industrial regions. Hong Kong was a major SARS epicenter, downwind from China's Guangdong industrial region. Of Hong Kong's 11 districts, the highest incidence of SARS was found in the district with the highest air pollution. The most intense epidemic occurred in the Amoy Gardens, a high-rise apartment complex. Strangely, most of the cases occurred at floor 10 and above, indicating vulnerability to stratified industrial smokestack pollution. As of a 2002 study, 40% of Hong Kong children suffer respiratory disease; thus, SARS appears to be a new name related to an old ailment. Six months after my SARS study was published by the Weston A. Price Foundation, a study was published by UCLA indicating a high correlation of SARS mortality with air pollution. SARS then left the panic scene, replaced by "Bird Flu." It appears that the "flu-like" West Nile virus epidemics are interpreted with industrial bias.11 In the New York City region, avian mortality reached record high in the years following increases in MTBE concentrations in gasoline in 1994. MTBE is a highly poisonous, unpublicized chemical, mandated into gasoline since at least the mid-1970s, as an oxygenate, purportedly � and disputably � to reduce air pollution. MTBE intensifies the existing toxic characteristics of engine exhausts, increasing levels of methyl nitrite and formaldehyde. The ban on MTBE was initiated by the EPA (Environmental Protection Agency) on July 27, 1999. That coincided with the apex of the first declared West Nile virus epidemic in the US. This flu-like disease, potentially fatal, is often diagnosed as meningitis and encephalitis. Preceding the human epidemic were findings of dead crows along expressways and bridge outlets. Initially, the New York State Department of Environmental Conservation (NYSDEC) actually blamed the 1999 avian epidemic on unspecified industrial pollution. About a month after a human epidemic was discovered, the CDC and local New York City Department of Health (NYCDOH) announced a virus epidemic through Mayor Rudolph Giuliani, September 3, 1999. This was highly dramatized in the media with a military-style attack on "the virus," using helicopters to spray the entire Tri-State Region with the organophosphate pesticide malathion. Four of the five boroughs were sprayed, though not Manhattan, which was fogged by truck. All the while, headlines blared, "The Deadly Virus." With this overpowering politic, the NYSDEC reversed its presumptive toxicological diagnoses, embraced the virus paradigm, and received funding for virus diagnostics of wildlife. The geographic epicenter location in 1999 is the same as the swine flu epicenter location for 2009; that is, Flushing Meadows, Queens, New York City. Swine Flu: Symptoms correlate well with environmental causation, yet the diagnostics lack toxicology. To argue for toxicological diagnostics, environmental factors are presented for US swine flu epidemics, as reported by the media and NYCDOH, beginning late April 2009. This school epidemic led the swine flu media furor which began in April 2009. This epidemic event represents the highest incidence worldwide for swine flu. The location of this school is Flushing Meadows. Incidence of flu symptoms spiked on April 23 at St. Francis School (see satellite photo).12 Five days later, the school was closed by the NYCDOH. One-third of students polled responded that they had experienced flu symptoms, and many cases were confirmed by the CDC as swine flu. In New York City, there is a tradition of official concern about air pollution, because, for instance, one-fourth of New York City school children have asthma, a disease related to air pollution and, as some researchers have found, neuropathologies. This might explain why, in New York City, it is illegal to idle an engine for more than 60 seconds near a school.13 In the vicinity of St. Francis Prep, engines do much more than idle. Eighteen lanes of traffic are adjacent St. Francis: Long Island Expressway, Horace Harding Expressway, and Francis Lewis Blvd. If nearby traffic loops and the Clearview Expressway, 1,000 feet to the east, are included, then the total vicinity traffic is at least 30 lanes. These lanes extend as straight lines for miles. It is important to understand the danger of long, straight lanes. A slow unidirectional wind in line with these straight traffic structures can target any nearby school or residence with high concentrations of vehicular exhaust as wind drifts through the lanes, accumulating and raising toxic concentrations. This scenario is more dangerous during rush hour or pre-sunrise hours when winds can slow and temperature inversions tend to occur. Note: in this commentary, SUIR stands for Slow, Unidirectional wind, In-line with Rush-hour traffic. This is not an established acronym, but to avoid repetition it is necessary, as a convenient designation for what is an apparently novel concept. Despite its novelty, it is common sense and common experience. For further clarification, see drawing "In-line Worst Case Scenario." Another, more conventional air hazard scenario is where slow wind predominantly crosses the traffic lanes at a 90 degree right angle. See "Crosswind Scenario." The cross-wind scenario is much less hazardous than the SUIR scenario. St. Francis is also exposed to a major airport, La Guardia Airport (LGA), one of the nation's busiest, situated 5 miles northwest, up the prevailing wind. The airport's main takeoff lane is directly in line with this school. Airliner turbines drive exhaust downward, mixing with ground-level air to an extent influenced by factors such as air temperature, convection efficiency, wind direction, and speed. One airliner during takeoff and landing is equivalent to a car driving approximately 5,600 miles, in terms of exhaust pollution.15 See map "LGA." Pollution data are not available in the immediate vicinity of St. Francis. There is no comprehensive air monitoring system on site. Regional and area data are available; for example, EPA ozone maps, weather data, and general studies of symptoms and dosage observations. 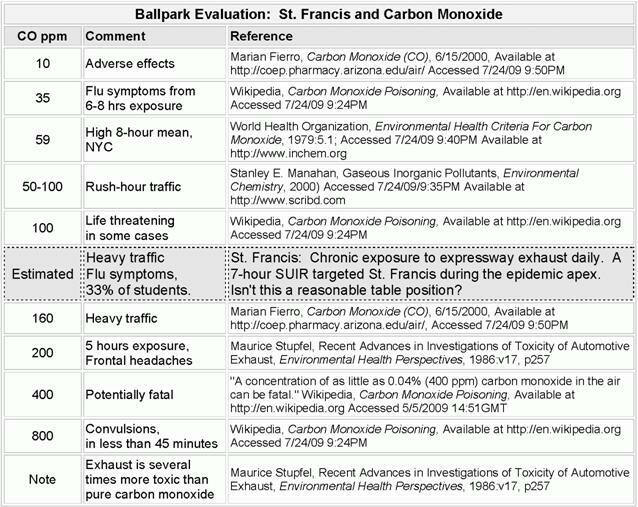 These are valuable data sources yet not sufficient to understand the toxicological plight of St. Francis. It is possible, using CO literature, to compare dosage and effects of the CO component of vehicular exhaust. This comparison places St. Francis within the hazard ballpark. See table, "Ballpark Evaluation." Disease can be conceptualized as symptoms resulting from the sum of stressors and stressor synergies. Air pollution stressors behave as constants and variables. They can be categorized as global, regional, local, adjacent, or internal to a building. Global, regional pollution is slow-changing, and relatively constant. Local and immediate pollution can be more variable. Airport pollution is a relative constant burden, though dependent on wind characteristics. Expressways are a local variable, always an extreme potential hazard, and variable exposures are dependent upon wind direction and speed. Air temperature inversions are a variable. Random, short-term air pollution attacks on a specific location are beyond the ability of EPA to publicly predict. Numerous constant and variable stressors can coincide at a specific location to create a disastrous sum of toxic stress, resulting in disease. The NYDEC, NYDOH, and CDC are aware of stressor probabilities for high-risk zones, because they run detailed models, taking days of computer time to determine worst-case scenarios. That could explain why expressway speed limits in the New York City area are mysteriously limited to 55 mph, though originally designed for 75 mph traffic. Thousands of people reside, study, work, and are transported near or within expressways. The slower speeds cut the volume of exhaust emissions in half, lessening the regularity of occurrence for the more obvious epidemics. Local weather, as a random coincidence of hazardous variables, is of the greatest importance. Such variables can change per minute or per second, from benign to acute � benign if the wind is blowing away from the target, and acute during a perfect SUIR. Basically, there are four weather factors that contribute to a SUIR. Wind direction: In-line with adjacent LIE expressway traffic (not merely cross-wind). Unwavering, unidirectional, source to target. A highly directional plume. Temperature inversion: Usually, warm exhausts move upward via convection into cooler upper layers. During an inversion, air strata temperatures are reversed, with warmer layers on top of cooler layers at ground level. Exhaust moves up through the lower cool layers, absorbing that coolness, and then upon encountering an upper (but low level) warm strata, convection is halted. The phenomena depends on other factors such as turbulence and layer location and structure. Inversions are common in pre-sunrise hours. Warm seasonal air temperatures: This can lower the efficiency for upward convection of warm exhausts. The epidemic apex at St. Francis began on April 23, as many students began lining up outside the nurse's office at approximately 9:30 a.m. They continued to line up throughout the rest of the day. A total of 102 students were sent home that day. This was very unusual, prompting the school nurse to call the NYCDOH at 10:30 a.m.
"More than 100 students at St. Francis Preparatory School in Queens were suddenly hit with fever, sore throat and other aches and pains. "'I just saw lot a lot of kids lined up along the wall near the nurse's office," sophomore Kelsey Dittmeir said.'" With such suddenness, questions must be asked: Is this a replicating virus, spreading upon contact from a few people (6 of over 2,500 students) who returned with an assumed infection from Mexico? Or is this a sudden increase in air poisoning? Students suddenly became ill at school during an unusual period of intense air pollution specific to the school. Why did the NYCDOH narrowly assume the virus paradigm? Environmental studies provide alternative answers. Coinciding with the epidemic apex is a set of unusual wind patterns, bringing high concentrations of expressway pollution to bear on St. Francis, as a SUIR scenario for 12 unrelenting hours. Wind patterns for the epidemic apex (April 23) have been studied in detail with Wvect software.20 See satellite photo "Wind Patterns 3�a.m.," where, for clarity, only wind patterns passing through St. Francis are designated.21 This reveals a dramatic steady focus of expressway pollution into the school, saturating its structure before school hours, and throughout the school day, from 12am to 12pm. Such wind patterns continued for 12 hours, from 12am through the school morning. For example, see satellite photo, "Wvect 4/23 3�00am," with winds from the northwest. By 9 a.m., the classes had been in session for 70 minutes. Wind patterns are shown for the period 8�a.m. These wind patterns continue into the afternoon, with some increasing dispersion after 11am. See satellite photo, "Wvect 4/23 8�00am," with winds from the northwest. The DAY BEFORE THE EPIDEMIC APEX (Wednesday, 4/22), few wind patterns cross traffic lanes towards St. Francis. There also are no usual number of visits to the nurse's office. Compare the two traffic maps for St. Francis, "Wind Pattern Study, April 22nd" and "Wind Pattern Study, April 23rd" and note the wind pattern differences. Note that on the DAY OF THE EPIDEMIC APEX (Thursday, 4/23), all wind patterns cross traffic lanes towards St. Francis, usually as a perfect SUIR. The NYCDOH produced a bar graph, "Date Of Illness Onset Of St. Francis Students," by polling students, asking for dates of perceived flu symptoms. The poll was finalized six days after the epidemic breakout. The NYCDOH compiled the poll in the midst of dramatic media publicity. This graph fits the publicized image of six virus-infected students returning from Mexico on April 20, after spring break. See the bar graph "Date of Illness Onset." The NYCDOH's data-gathering and evaluation were highly subjective. The symptoms reported by students after April 23 can be reasonably expected, due to fear induced from massive media hype, which occurred after the 23rd. Residual symptoms from that date would also be perceived as more serious due to the media hype. Students would be encouraged by parents to claim symptoms to avoid class as a precaution against supposed virus infection. The presence of the questionnaire itself is a bias factor. The NYCDOH chose not to use objective data, recorded at the nurse's office. Prior to April 23, the nurse had recorded data without presumptions, without knowledge of the impending epidemic. Her records resolve the contradictions established by the NYCDOH's bar graph and the wind vector studies. The nurse was interviewed to discover actual visits and activity at her office, recorded before, during, and after the epidemic apex. Critical data acquired during the nurse interview confirm the wind studies and contradict the NYCDOH graph.23 The nurse stated that there were absolutely no unusual number of visits to her office, no unusual activity, in the week prior to the April 23 outbreak; that is, since April 20, when the six students returned from Mexico. She also stated that, to the best of her knowledge, there was no environmental testing on or after the 23rd, regarding, for example, ventilation system, painting, floor surfacing, expressway, or gases. When asked if the omission of environmental studies was "because the epidemic was viral?" she replied, "Yes." The nurse gave counts for students sent home on April 23 and 24, which confirmed counts already public information. She speculated as to why her records prior to April 23 did not conform to the NYCDOH poll, stating that symptoms may have been too low level for students to visit her office. See "NYCDOH Graph Comparison." The NYCDOH's graph dramatizes the virus theory by showing a classic logarithmic rise in number of flu symptoms beginning on April 20, when the six students returned from Mexico vacation, presumably infected. To understand toxicological avoidance, I posed a simple question on the NYCDOH Swine Flu Forum (June 24, 2009).25 This forum was managed by Dr. Susan Kansagra, who "worked on the Health Department team that's responding to this outbreak." Question: "Is the flu investigation team reviewing air pollution at the closed schools?" Dr. Kansagra replied, unusually off-topic, "Like all flu viruses, H1N1 virus is spread mainly through respiratory droplets when an infected person coughs or sneezes." The question was repeated. The forum was closed. Usually, questions were answered within 20 minutes to three hours. In this case, Kansagra's off-topic reply and forum shutdown arrived two days later. The original question had been passed up in favor of answering others, until the off-topic reply. The closing of forums is not unusual, along with censure, bans, top-down declarations of "fact," and ad hominem arguments. I had noticed there were few symptoms reported by the NYCDOH poll during the second and third week of April, yet area pollution readings were high according to the averaged AQI levels shown by EPA AIRnow maps. To understand this contradiction, I referenced the New York Department of Education and found that there was no spring break at that time. This was puzzling. Later, I found that St. Francis, being a Catholic school, was not following the New York City calendar, and had indeed been on spring break, thus conforming to the air pollution theory. Details of this case need confirmation, because it concerns an individual, where data is difficult to obtain and difficult to describe due to privacy ethics. Years ago, a rare case of flu, severe enough to be highly publicized (though with scant detail), occurred in the New York City region. At that time, I had noted this case for future study. While gathering data for this current paper, I found that the victim was hospitalized while apparently attending St. Francis Prep during a SUIR, with diagnostics and antibiotic treatments immediately preceding an severe acute disease episode. This victim was already mildly ill and possibly already undergoing pharmaceutical treatment when the acute symptoms suddenly appeared. This school was reported secondly in the New York regional media, and nationally this epidemic vied for attention with the emerging Texas swine flu news. See photo-map "Rye School." Only four cases were confirmed as swine flu. The school was scheduled to close on May 5, 2009, apparently because administrators were influenced by the heavy St. Francis publicity and because one Rye School student had the week before arrived from a visit to Mexico and became ill with mild flu symptoms on April 27, 2009. On that day the wind was from the two expressways. The average wind speed was very slow, one of the slowest of the month, averaging 2.7 mph during the school hours. A wind plume map has been depicted as a series of wind vectors from the school. This reveals a SUIR, though not as unwaveringly focused, nor as close to the pollution sources, as the St. Francis SUIR. Accordingly, there were not as many cases of flu symptoms during the period circa April 27. See photo-map "Rye School : Wind Direction Vectors." These schools are not adjacent to expressway traffic. However, seven expressways lie as a perimeter around the schools at 2 to 3 miles' distance. These could not easily account for a sudden onset of flu symptoms. A contradiction looms. Assuming expressway pollution at this distance is a somewhat constant low-level exposure, and assuming virus = biomarker for poisoning, then further study resolves contradictions, finding a source of air pollution approximately 200 feet east of the school border; that is, a major Superfund site and ongoing industry. Contaminants include, for example, chlorines, xylenes, and benzenes. During prior years, 50,000 tons of soil was "remediated," which means toxins discharged to the atmosphere. Current status of operation is difficult to determine but it appears that clean-up operations are now minimal. The EPA lists only one of these Superfund sites as possibly active, SMS Instruments Inc.
Other school epidemics have been reviewed with similar findings that argue for toxicological diagnostics. The supposed global epicenter at La Gloria, Mexico, was also reviewed and found to have obvious toxicological factors. With every review of any epidemic or case, findings vary; that is, toxicological modes and events vary, yet there is an ease with which data sensibly fall into place. The toxicological argument is slowed by data blockage and Orwellian definitions; otherwise, the toxicological argument always benefits from more data. The toxicological approach sets the foundation for a general toxicological theory of disease where Occam's razor thrives. Patients as well as medical people are encouraged to demand environmental reviews as essential protocol, and to look skeptically at any paradigm that does not include a full toxicological review. All diagnostics should be moot unless pollution and pharmaceuticals are fully discounted. Disease symptoms themselves are freely available indicators of environmental hazards, and they have no conflict of interest with chemical industries. They are the ultimate indicators. Relevant new ideas and information often arrive by focusing on the possibilities of air pollution as revealed by timeline analyses of symptoms. A tremendous variety of symptoms, too many to list here, can be bioindicators of low-level, chronic air poisoning, or brief acute poisoning, which are below the threshold of technical detection, or out of the scope of politicized technical detection. The symptom is the bottom line. This informal toxicology can be confused and complicated by nutritional ignorance, chlorinated-fluorinated water, pesticides, pharmaceuticals, cigarettes, caffeine, and alcohol. Fewer toxicological variables means simpler and more successful diagnostics. One could argue forever about germs and whether they are symbionts or pathogens. It is most effective to simply leave the burden of proof where it belongs, on those who claim germ causation. They must be routinely confronted with the simple position that all claims for germ pathology are moot until toxicology is discounted. A single question is challenging enough: "Why is toxicology omitted?" Many areas of medical expertise can be effectively challenged with that question; for example, microbiology, diagnostics, and epidemiology. The process of selecting schools for this study was unbiased. The first three school swine flu epicenters announced by mainstream media in 2009 were studied. Many other schools in the New York City area have also been studied. The intent of this commentary is literary, critical, and academic, for discussion. An ethical medical professional should be consulted regarding medical issues. Jim West served as chairman of the Science Committee for NoSpray Coalition, which successfully litigated (2000�07) against the Giuliani administration (NYC) regarding pesticide spray campaigns. He is a member of GreenSpeakers, Toastmasters, and ARAS (Canada). He studied mechanical and chemical engineering at ASU, and has resided in New York City for the past three decades. Contact information: harpub@hotmail.com. 1. Regush, N. Virus or environment. ABC News. Aug. 29, 2001. http://abcnews.go.com/Health/story?id=117258&page=1. Accessed Dec. 7, 2009. 2. Carbon monoxide poisoning [web page]. Wikipedia. http://en.wikipedia.org/wiki/Carbon_monoxide_poisoning. Wikipedia. Accessed July 20, 2009. 3. Krivoshto et al. The toxicity of diesel exhaust: implications for primary care. J Am Board Fam Med. 2008;21(1):55�. Available at: http://www.jabfm.org/cgi/content/full/21/1/55. Relevant extracts: "Diesel exhaust is 100 times more toxic than gasoline exhaust, even when carbon monoxide is considered" and "gasoline exhaust, which contains 28 times more carbon monoxide than diesel exhaust." Accessed Dec. 7, 2009. 4. Gabrielse D. Play it safe with engines. Occup Health Saf. http://ohsonline.com/Articles/2009/01/01/Safe-with-Engines.aspx, Accessed July 20, 2009. 5. Carbon monoxide poisoning [web page]. Maimonides Medical Center. Available at: https://www.maimonidesmed.org, Accessed July 20, 2009. 6. Carbon monoxide poisoning. Wikipedia.Op. cit. 7. Diesel exhaust particulates reasonably anticipated to be a human carcinogen. In: National Toxicology Program. Department of Health and Human Services. Ninth Report on Carcinogens. 2000. Available at: http://ntp.niehs.nih.gov/ntp/roc/eleventh/profiles/s069dies.pdf. Accessed Dec. 8, 2009. 8. Dolan MC, Haltom TL, Barrows GH, Short CS, Ferriell KM. Carboxyhemoglobin levels in patients with flu-like symptoms. Ann Emerg Med. 1987;16 ISS7:752�6. 9. Sadovnikoff N, Varon J, Sternbach GL. Carbon monoxide poisoning. An occult epidemic. Postgrad Med. 1992;4:15;86�,92�. 10. Brown P. 50 years after the great smog, a new killer arises. Guardian. Nov. 30, 2002. Accessed July 18, 2009. 11. West J. West Nile virus positives and MTBE. Townsend Lett. 2002;228:64�. 12. Google Maps online: All satellite photos and maps. 13. Council of the City of New York. Council votes to toughen engine idling restrictions near city schools. PR005-2009. Jan. 28, 2009. 14. Hu S. A wide area of air pollutant impact downwind of a freeway during pre-sunrise hours. Atmos Environ. 2009;43:2541�49. 15. Transportation facts [Web page]. Coalition for Clean Air. http://www.coalitionforcleanair.org/our-programs-transportation-facts.html. Accessed July 20, 2009. 16. West J. Geography: toxicology and WNV encephalitis. http://www.harpub.co.cc/noxot/epidGeog.htm. Accessed July 20, 2009. 17. House Transportation and Infrastructure Subcommittee on Aviation. Statement by Louise E. Maillett, Acting Assistant Administrator for Policy, Planning And International Aviation, Federal Aviation Administration, Department of Transportation. Dec. 5, 2000. Available at: http://testimony.ost.dot.gov/test/pasttest/00test/Maillett2.htm. Accessed Aug. 1, 2009. 18. Carlin D. Confirmed: swine flu outbreak at Queens school [Web article]. CBS Broadcasting. April 29, 2009. http://wcbstv.com/health/swine.flu.nyc.2.994071.html. Accessed December 7, 2009. 19. Hartocollis A. School nurse's response to flu wins applause. New York Times. April 28, 2009. 20. Wvect software, engineered by MaguSoft. 21. All maps are Google Maps: http://maps.google.com. 22. New York City Department of Health and Mental Hygiene. St. Francis Prep update: swine flu outbreak: Survey Monkey results. Available at: www.nyc.gov/html/doh/downloads/pdf/cd/h1n1_stfrancis_survey.pdf. Accessed Oct. 3, 2009. 23. Harvey E. Interview of Nurse Mary Pappas, of St. Francis Prep. Sept. 18, 2009. Transcription. 24. In 2001, Nicholas Regush of ABC News attempted to contact NYCDOH regarding air pollution and West Nile virus epidemics. The press office interrogated him at such length that he told them, "I'm supposed to be interviewing you, not the other way around!" NYCDOH did not respond for interviews. Personal communication. 25. Kansagra S. H1N1 flu. nycHealthy [blog]. http://pulse.typepad.com/nychealthy/2009/05/dr-susan-kansagra-h1n1-flu.html. Accessed July 20, 2009. 26. SMS Instruments. EPA Region 2 [online document]. Available at: http://www.epa.gov/region2/superfund/npl/0201325c.pdf. Accessed Jan. 4, 2009. 28. West J. Images of poliomyelitis � a critique of scientific literature. Townsend Lett. 2000;203:68�. 29. West J. West Nile Virus positives and MTBE. Townsend Lett. 2002;228:64�. 30. West J. The SARS epidemic: are viruses taking the rap for industrial poisons? Wise Traditions. Dec. 7, 2003. Available at: www.westonaprice.org/envtoxins/sarsepidemic.html. 31. Rappoport J. Has Jim West turned conventional knowledge about bird flu upside down? No More Fake News [blog]. http://www.nomorefakenews.com/archives/archiveview.php?key=2961. Accessed Dec. 7, 2009. 32. NoSpray Coalition. http://nospray.org. Coordinator, Mitchel Cohen, chairman of the NYC WBAI board. 33. Sheri Nakken, RN; director, Vaccination Information & Choice Network: http://www.wellwithin1.com/vaccine.htm. 34. Gary Krasner, director of Coalition For Informed Choice (CFIC), Queens, NY: http://www.cfic.us. 35. Rami Nagel, author, researcher, consultant on medical alternatives: http://www.healingourchildren.net. 36. John Scudamore, curator of an online collection of medical investigations: http://www.whale.to.